Many students trek to and from class across the paths around the Earl Gregg Swem Library’s sundial. Now, this sundial and its well-traveled connecting walkways have a new name: the Mary-Cooke Branch Munford Plaza. When the College of William and Mary’s Board of Visitors met Friday, Sept. 28, one of its final resolutions was to honor Mary-Cooke Branch Munford, the first woman appointed to the Board. This resolution officially renamed the area between the Earl Gregg Swem Library, Andrews Hall, Small Hall and the Integrated Science Center. 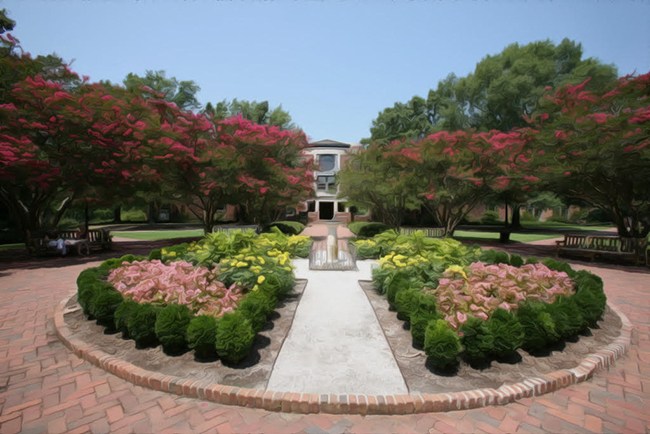 “It’s an area that’s traveled by just about every person that comes to William and Mary whether you’re on a visit or a student in the area,” Board Secretary Sue Gerdelman ’76 said. Gerdelman introduced the resolution, which was a product of the 100th Anniversary Committee, led by law professor Jayne Barnard and Director of Alumnae Initiatives Val Cushman. Gerdelman said that Barnard and Cushman considered several possible ways to honor Munford, and decided on renaming this plaza because of its symbolic significance. Gerdelman said that she finds this area fitting for the tribute because it connects social sciences, performing arts and science buildings, which were all disciplines Munford supported. Previously, the College had named a building at the Dillard Complex in her honor, but because those buildings are now only used for active shooter and firefighter training, her name has been removed. Munford was raised in Richmond, Virginia, and is often cited as a prominent women’s rights advocate. She was also passionate about educational reform. She helped found the Richmond Education Association in 1901 and held various leadership positions in the Cooperative Education Association of Virginia, which was founded in 1903. Munford supported Virginia General Assembly legislation that allowed for co-education at the College beginning in 1918, and in 1920 she was appointed to the College’s Board, becoming the first woman to serve in that seat. She also supported legislation to allow co-education at the University of Virginia, but was not successful at the time. In 1926, she was appointed to the UVA Board of Visitors. The resolution also declares that the Board will be responsible for presenting a copy of the final resolution to Munford’s family, and for sharing the College’s appreciation for the work that Munford did during her life.